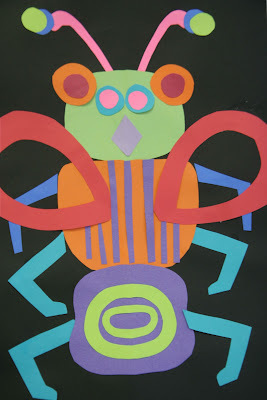 This is a cute, one-day lesson I found over at davinciswings.blogspot.com. 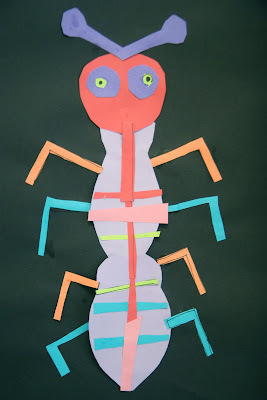 I had pinned this lesson months ago and decided since Spring has sprung and the bugs will be out...what better time to do symmetrical bugs? Also, the 2nd and 3rd graders are working on lines of symmetry. 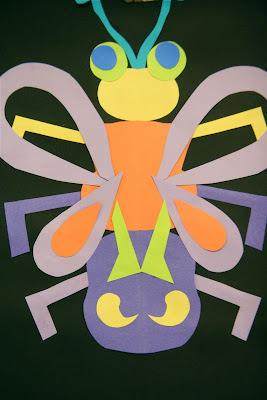 So, we discussed examples of things around the room and in nature that are symmetrical. I drew several shapes on the board and the students agreed on which ones were symmetrical and which ones were not. And, lastly, I showed them examples from Da Vinci's Wings so they could see some student work. These are really good. I'm trying to do a presentation for my class at the moment. This has given me a lot of inspiration. Thanks! These are super cute! I think they would be wonderful to make near Halloween. I have pinned this post. Thanks for sharing! Can you please explain what directions you gave the kids? Did you just cut out the shapes/wings/legs/bodies yourself, then tell the kids to use them to make symmetrical bugs? Thanks!